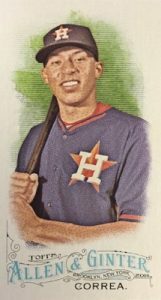 As the eleventh edition of the popular product, 2016 Topps Allen & Ginter Baseball mixes the familiar with a few new wrinkles including an appearance from Kevin Costner. 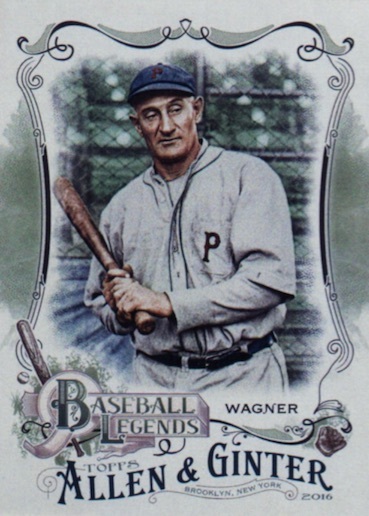 Hobby boxes offer three total hits between options consisting of autographs, relics, book cards, cut signatures or rip cards. 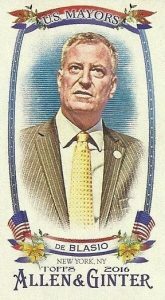 Sticking to the normal format, the base set includes 350 cards with the final 50 cards (#301-350) issued as short prints that drop 1:2 packs. Base parallels are limited to just one-of-one Glossy. 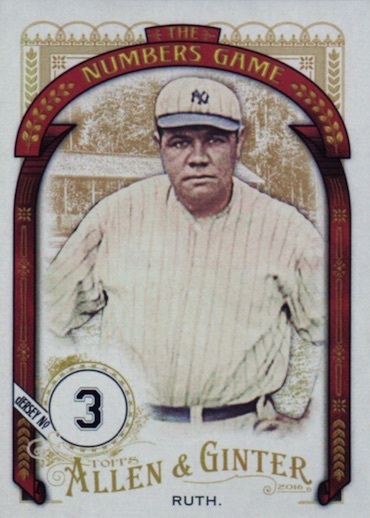 Mini parallels, averaging one per pack, cover the full base set with several choices: Mini, A&G Back (1:5 packs, A&G Black Bordered (1:10 packs), A&G No Number, A&G Brooklyn Back (#/25), A&G Wood (1/1 - Hobby only), A&G Glossy (1/1) and Framed Mini Printing Plates (1/1). There is also a hobby-exclusive Mini Metal parallel (#/3) that is limited to 100 subjects and a hobby-exclusive Cloth parallel (#/10) that includes 150 subjects. 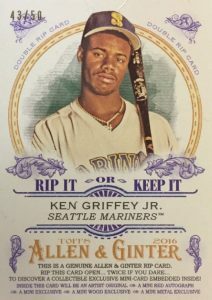 2016 Topps Allen & Ginter Baseball hits come in multiple forms. The standard Relics are full-size and showcase two different designs with 60 subjects in each. Framed Mini Relics add 50 more options. 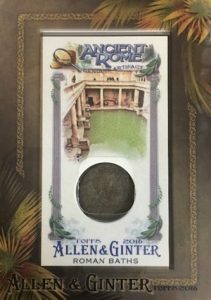 Appearing in the product for the first time, hobby-only Ancient Rome Relics feature authentic Roman coins and are also available in a Silver Coin (1/1) parallel. 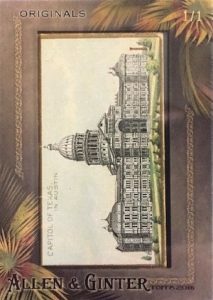 The main Autographs carry the regular form with framed mini cards featuring an on-card signature. Black Framed (#/25) and Red Ink (#/10) parallels add rarity to the mix. Exclusive to hobby boxes, Book Cards (#/10) include up to 50 subjects with an autograph and relic. Other hits are among rarest cards in the release with Framed Original buybacks (1/1) and Cut Signatures (1/1). Long a favorite of the collecting world, Rip Cards return in hobby boxes at one per case and Double Rip Cards up the ante. Forcing collectors to rip or not to rip, possible finds inside include A&G Artist's Originals, Red Autographs (#/10) or Mini Exclusives in the form of base (#351-400), Mini Metal Exclusives (#/3) and Mini Wood Exclusives (1/1). 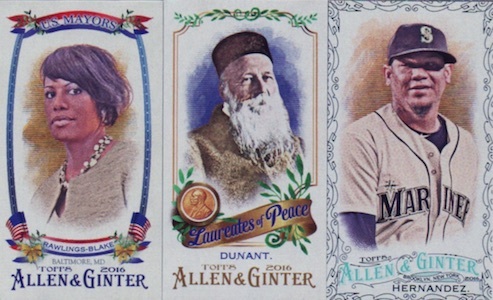 Basic inserts round out 2016 Topps Allen & Ginter Baseball in both traditional size and mini. Full-size inserts include The Numbers Game which tells the story behind players and their jersey numbers over 100 cards that average 1:2 packs. There are also 25 Baseball Legends and 20 Natural Wonders. Combining to average 1:5 packs, mini inserts consist of 35 U.S. Mayors, 15 Subways and Streetcars, 10 Laureates of Peace (Nobel Prize winners) and 15 Ferocious Felines. Providing one last option for collectors, box loaders are only found in hobby boxes. Choices include base Box Loaders, Box Loaders Relic (#/25), Box Loaders Autograph (#/15), Box Loaders Autographed Relic (#/5) Box Loaders Cut Signature (1/1) and Cabinet Relics (1/1). 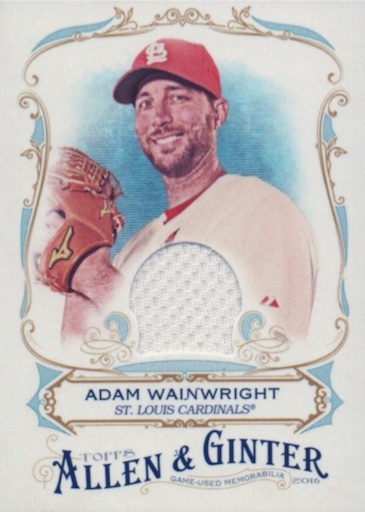 A&G fans can also find oversized versions and wall art for the 2016 cards via Topps' Online Store. 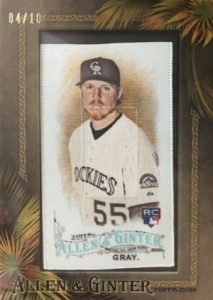 CORD MCCOY 2016 TOPPS ALLEN & GINTER MINI AUTO. FRAMED #AGA-CM RODEO CHAMPION. 351 cards. 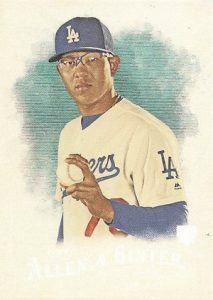 *Card #120 is listed for two different players on the official checklist (Urias & Maeda) but the Urias card is not numbered. 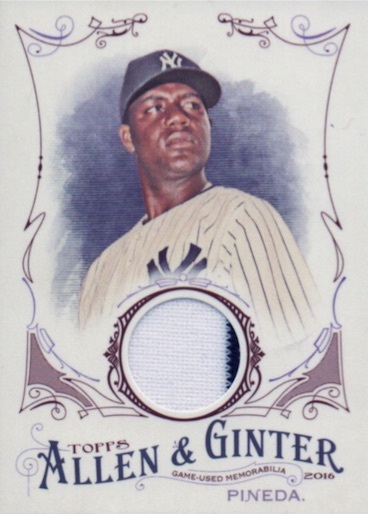 Urias is believed to be a super short print (SSP). Cards #301-350 are short prints (SP) - 1:2 packs. 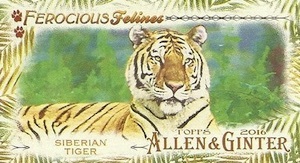 PARALLEL CARDS: A&G Glossy 1/1. MINI PARALLEL CARDS: Base Mini, A&G Back - 1:5 packs, A&G Black-Bordered - 1:10 packs, A&G No Number #/50, A&G Brooklyn Back #/25, A&G Wood 1/1 (Hobby), A&G Glossy 1/1. 50 cards. Cards #351-400. Hobby only. 150 cards. Serial Numbered #/10. Hobby only. 100 cards. Serial Numbered #/3. Hobby only. PARALLEL CARDS: Silver Frame (Silver Ink), Black Framed #/25, Red Ink #/10. 47 cards. View a full guide and gallery. PARALLEL CARDS: Silver Frame (Silver Ink), Black Frame #/25, Red Ink #/10. PARALLEL CARDS: Silver Coin 1/1. 35 cards. Serial Numbered #/10. Hobby only. All mini inserts combine to fall 1:5 packs. Unannounced mini insert. 1:26,436 packs. Design A - 52 cards. Design B - 55 cards. Unannounced mini insert. Case hit. 1:288 packs. Serial numbered 1/1. Hobby only. All rip cards are exclusive to hobby. 100 cards. 1 per case. All box loaders are exclusive to hobby. Here are the top 10 deals on hobby boxes currently listed on eBay. Here are the top deals on hobby cases currently listed on eBay. Good: Strong card quality (as usual), wide variety of topics covered, unmatched in the quirky department. Bad: Not the greatest list of signers, box price is a bit high when you can end up with three basic relics, doesn’t feel as exciting as previous years. 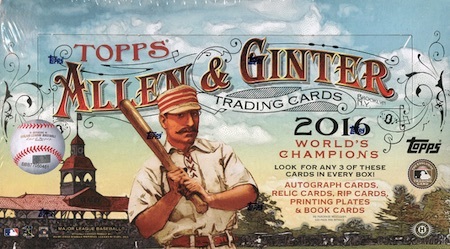 The Bottom Line: 2016 Allen & Ginter Baseball takes the stance of a lot of products these days where if you already are a huge fan of the brand, it won’t change that opinion. However, the product as a whole doesn’t have that same wow factor of prior years and the “surprises” were not as impressive. 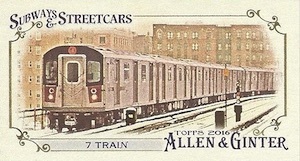 Nevertheless, A&G remains a unique offering with a quality design and vast coverage. The yearly design changes for A&G can best be described as small tweaks. 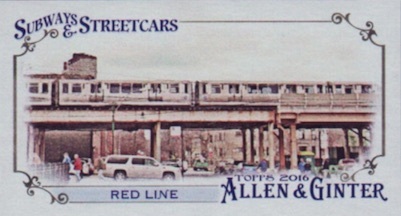 For the 2016 base, that means a centered brand logo on the bottom of the card and the removal of the frame design from 2015. 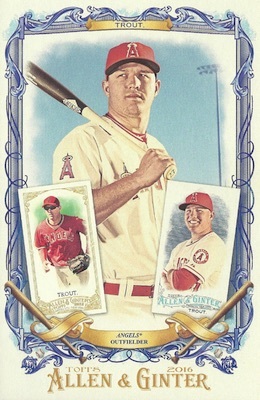 Other than that, little has changed, but that is really the Ginter way. There is also a new frame color for the autographs. Brown is not normally my favorite but it works fine. 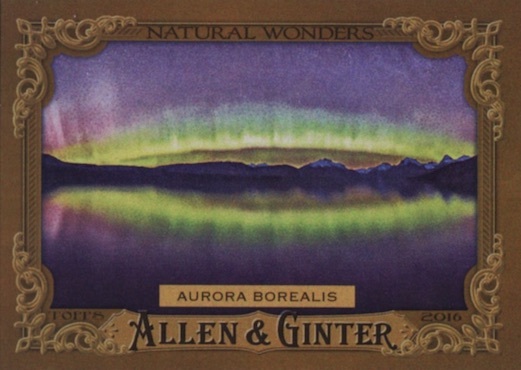 Although the inserts and minis are all new, 2016 Allen & Ginter Baseball keeps the status quo and none really stand out from a design perspective except for Natural Wonders, which is packed with color and a ornate frame. Make no mistake, there are some rare hits in A&G. But the hits from the average box are fairly underwhelming in person, especially the base relics. I do think the autograph design is solid but I am always less impressed by the tiny singing space that it allows. No matter your thoughts on A&G, most can agree the set revolves heavily around the non-baseball signers. While there is an interesting mix, it seems to be going way too deep into the sportscaster pool. That’s not to say there aren’t some valuable signers, it’s just that the highs are not as high as other years and there are much more randoms to be found. Sure, Kevin Costner and Susan Sarandon are big names but they were already in Archives this year. Even the limited champions largely suffer from bad timing. Maria Sharapova is still dealing with her suspension issues and swimmer Missy Franklin did not enjoy the Olympic success in 2016 like she did in 2012. 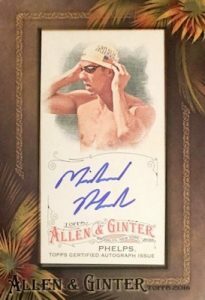 Of course, there is the trusty Michael Phelps who has already signed plenty for other sets, but he is one of the clear standouts. I know it is easier said than done, but there needs to be a renewed focus on notable sports champions. 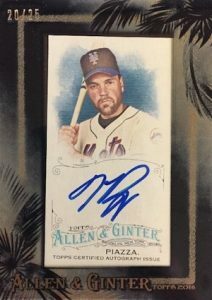 The baseball signers are a bit better with Griffey and Piazza in their Hall of Fame induction year as well as rookie autographs for Trevor Story and Nomar Mazara. Otherwise, the checklist is fairly standard, without the crazy or offbeat options one might expect. In addition to the standard pair of “surprise” mini inserts, the only real unexpected cards are the late-added Julio Urias SP rookie and the incredibly-tough-to-hit Greenland Explorer mini (1:26,436 packs). An overall down year for non-baseball autographs combined with less of the rare hits of previous sets is what hurts value the most. That’s the problem with a product geared to set collectors that also tries to go after the hit chasers. The price point is simply too high for no guaranteed autographs among the three hits. The fact that they can be a trio of single-color relics makes that an even bigger issue. Although, many of the signers carry little value, as well. 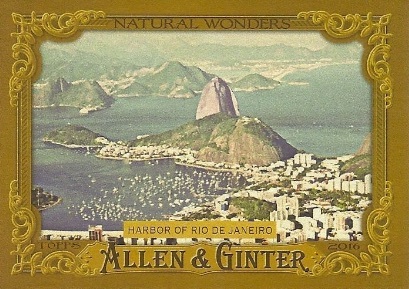 Allen & Ginter is an experience. Something about the way the cards look and feel just seems to evoke a different response from me. Boxes may not always deliver, but it just feels more exciting not knowing what is waiting, especially since it is not limited to one sport or even the world of sports. 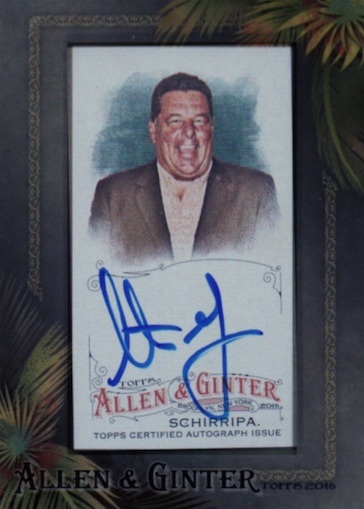 My personal box did not yield anything amazing but I was pleased by the Steve Schirripa autograph (Bobby Baccalieri from The Sopranos). Not the most valuable by any means, but plenty of the non-baseball signers would have been less appealing to me personally. 2016 Topps Allen and Ginter Framed Mini TREA TURNER RC Auto BGS 9.5 10 POP 4! You have Stephen Piscotty in two places, #251 & #338. Is this an error? This is the official checklist from Topps. We are reaching out to them to see if there is any further information. There are a couple players that have 2 cards listed in the set. I’m assuming just an error in the initial checklist. 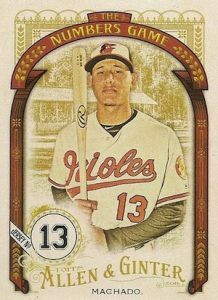 Tyler � I checked with Topps and the two rookie players listed for #120 (Urias & Maeda) and two cards for Turner, Piscotty and Refsnyder are all apparently correct. Topps, Topps, Topps……. come on now. Soooooooo many Yankees and no Orioles like always I’m sick and tired of it. The Yankees get 20 cards and the Orioles…get 6, that’s not even right. The Orioles have the most wins in the AL since 2012 but they never get any love. The Yankees get a card for Pineda who is 3-8 with a 5.38 ERA, Teixeira who is batting .193, and a card for Bird who had shoulder surgery before the season and ruled out for the whole entire year. The O’s don’t get a card for Britton one of the best closers in the game who’s 27-27 in saves, Chris Tillman who is 12-2, Chris Davis who is leading the Majors in home runs since 2013, and I read Wieters and Topps agreed to a deal finally so how long is it gonna take to make a card for him. They continue with the same old tired minis. When are they going to get a little more creative and change these around? Rome has had its day, why not bring in something like famous people with glasses, or even presidents of different countries. Maybe the gods and goddesses or cartoon times. 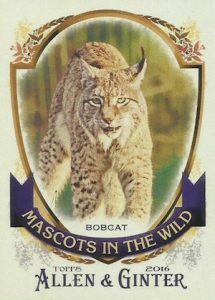 Get creative Topps, have Bernie Brewer be a mascot and make it a tough card to get, or the progression of TVs. Ship wreck finds or most expensive houses in the world. 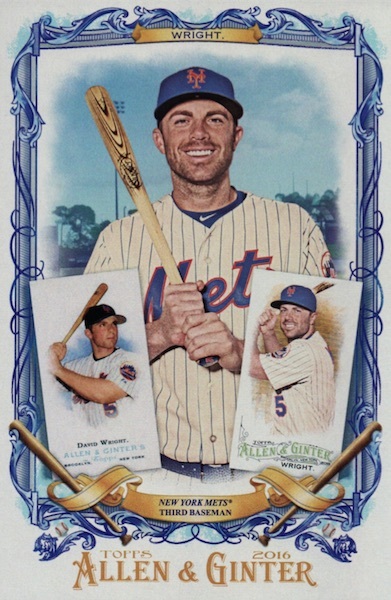 Come on Topps…get some better actors and comedians into the mix. Best Super Bowl commercials could be another one. I could go on and on, and I would like to see some current situations or comedians because then you make the set for the time it is released in. The only thing current are the rookies. Computers through time or game systems over time. That would be something fun and exciting. Bottom line, they need to hire a 22 year old for checklists. More of the same stuff as previous years of this product. Most boxes will not have autos and instead have boring and usually valueless single color relic cards. 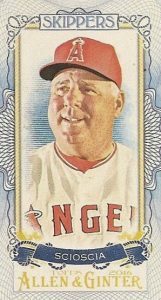 On the off chance you get an auto it won’t be worth as much as you think it should be because it will be of someone has never heard of or a marginal player. Rip cards are definitely what you want to pull but they are near impossible to pull unless you open this product by the case. I do love the fact that this set always has pretty interesting subjects but can see the value of opening this product anymore. Overall, I’m not sure what to think about this product, because it looks very similar to the previous releases. I look forward to this product each and every year, I must say, the comedians have to go and a cool insert mini could have been on the black card stock from the “X” series. maybe put a chrome border on a black card stock? At our card shop the guys are snubbing their noses to A & G this year, and are spending on Goodwins. Fancy 3-d cards and value $$$ has them smiling like children. Overall I have to agree, to many yanks, to many comedians and too many sports writers…Adam has some great ideas! 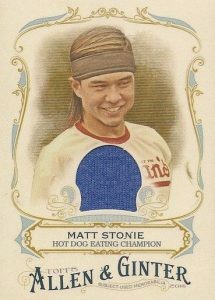 Cmon Topps, no Rush autos yet? Geddy is a huge baseball fan. Only 3 cards worth anybodys time the three boxers. Other thanks but no thanks. The pope was drafted!?! BY WHO! I’m going to go out on a limb annnnnnd….guess…. The Cardinals! No … The Angels…. Disappointing to read such reviews as the product was quite solid last year. I love this product every year. It is very fun to crack box after box. Great autos, a ton of relics and awesome checklist. I will never understand Ginter but will always love it. Bought one box and ended up with 4 relics. I don’t hate this product, but I’m not blown away by it yet either. And I know this will sound like a minor gripe, but they had a built in numbering system for the insert set of Numbers Game. They could have easily done jersey number 1 as card number 1 in the insert set and jersey number 2 as card number 2 and so on. I wonder why it is they decided not to do this. It would make things much easier for someone that is a set builder to just use the numbers on the front of the cards as the number on the back too. I think Topps could take some advice on some of the smaller things to tweak in this set. Some really great ideas already mentioned above. I will continue to build this set and see if my feelings towards it change, but as of right now, I only feel good about it for nostalgia reasons. I have 4 more boxes coming this week, so I will rip those and see what I find. 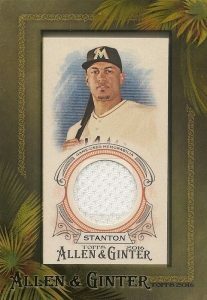 I really like the cut and clean look of the Allen & Ginter cards. They look and feel superior to any other set. They exclusives and one offs are rare, and hard to find. The Numbers Game bothers me even more. Ortiz and Ryan both have cards for 34, and the back of each card mentions the other. I think this was a missed opportunity for a cool insert set that could have had numbers that were worn by non-star players in the past. Could have had some interesting facts about lesser known guys that maybe never appeared in many sets. I think that could have helped bit. Maybe I just got lucky…. But I don’t know why everyone is complaining about A&G. It looks the same? Nah, it looks similar to years prior because they’re maintaining a specific theme. AND I LIKE THAT. Also, the hits in here are pretty darn good. I pulled a 6/10 Ozzie Smith cloth, hand numbered brooklyn back Steinberg mini, Joey Votto relic, Mendoza Relic, oh…. AND a Degrom black border mini redemption. If you ask me, this stuff is stacked, high quality material, and WELL priced. I would recommend buying now before other people realize it’s potential. One box, three hits: three single color patches. What a joke, a horrible joke. Obviously, Topps feels no shame, no matter how inferior the product is. This sort of cr*ppy box isn’t even an anomaly–it sure seems to be the norm. 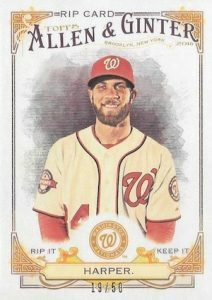 A&G further illustrates what most of Topps’ recent releases have shown: the whole thing is stretched beyond viability, with $100+ boxes yielding unknowns’ autos and useless single-color patches (at these prices, base cards just don’t cut it). A&G can take it’s place with Archives, Museum, GQ, and Tribute on the junk plie. Nothing standout or amazing this year! The ty cobb cut auto was pulled the first night and sold. Other than that, take a look at any value. None!! Roman coins easily picked up for $80-$100 on ebay. Kevin costner autos are pulled and sitting listed. No new names really, or mini sets. No oddity cards, no dna relics, no 1/1 redemptions like the “useless rat bones” last year. And im pretty sure any of the great cut autos will show up from one of two sellers who miraculously pulled everyone of them alone. 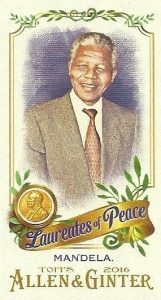 Rip cards are posted on ebay in numbers as the truth should be shown that theres no real worth in them anymore. 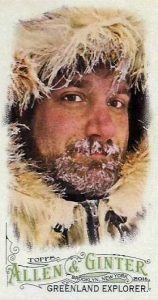 Allen ginter caught my eye with the strange and rare amazing pulls from years past! That is diminishing now as its apparent greed and no care for its loyal fans is right in the open. Its all about high end now people. Spend more/get less. No Carlos Gonzalez in the Set? Kaizen Rodriguez � He has a full-size jersey relic. Stephen � Are you certain the hanger was still factory sealed and the pack looked correct when you opened it? I know other collectors have run into an issue where another individual apparently purchased a hanger/blaster, opened it and replaced the cards they wanted with older cards before resealing and then returning it for a refund. I have not heard about about hangers as much but it is impossible that a 14-card A&G pack would have 12 cards be buybacks, all from the same years. Well the Target I went to get the pack, I worked at last year and I worked the Service Desk and cards are something you cannot return under any circumstance and that is not just a Target rule. I still have the pack and it looks legit.. IDK.. 10 cards were from 77 the other 2 were 78′ and 79′. I’m going to call Topps and see what they say. 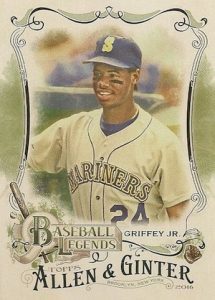 When I was a kid me and my Dad bought a pack up Upper Deck and half the Cards were Ken Griffey Jr. rookie cards and the other half some other player so maybe sometimes weird things happen. Bought 2 boxes of these. I had 4 hits including a Sharapova auto and a roman coin in one box. And basic 3 jersey relics in the other box. Does anyone have any ideas on which autographs are short printed ? I haven’t seen anything out of Topps as to print runs. I’ve pulled so far, Bryant, Phelps, Seager and a couple of other higher book autos from the product this year, along with several Roman coins and a bunch of rip cards. Any help with any kind of print run would be appreciated, thanks. I just opened a box of A & G and got two mini Mike Trouts, both have the A&G backs, but one is number 10 and the other has no number. They have different Code at the bottom also. CMP024935 & CMP024937. The latter has NO NUMBER. Any Idea ???? 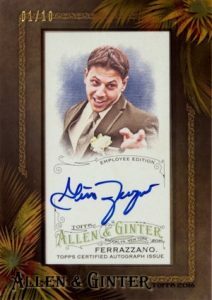 2016 TOPPS ALLEN & GINTER BASEBALL HOBBY BOX NEW FACTORY SEALED AUTO'S RELIC'S ? 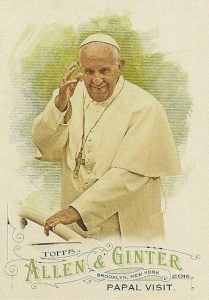 2016 Topps Allen & Ginter Baseball Hobby Box - Factory Sealed!